A partial view of "Better Luck Next Time," courtesy of Xxavier Carter. Two days before the MFA Thesis Qualifying Exhibition, Xxavier Carter's long-planned project was turned upside down. 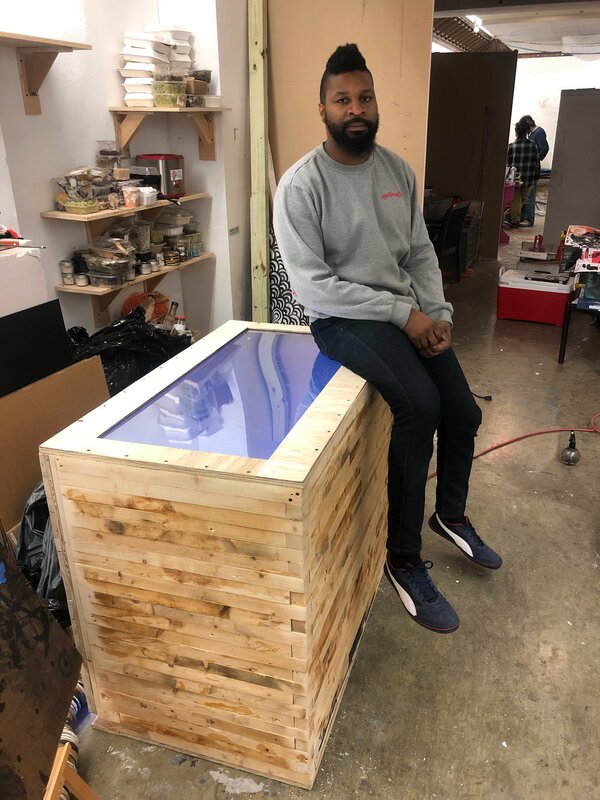 Xxavier Carter will present his MFA Thesis Qualifying Exhibition tonight at SMU, but it’s not the work that he had been planning for two years. About 48 hours before the pivotal moment in the artist’s career, the university told him to change the core of the project. The point of controversy: Carter was going to cut himself in front of the audience. His four-part performance, titled “Rumor Has It,” included him reopening 40 scars on his body using a seven inch filet knife. “This was definitely the biggest part of the exhibition and the bulk of my MFA research had been leading to this performance,” he says. SMU doesn’t agree. The Algur H. Meadows Dean Samuel S. Holland communicated in an email sent to Carter on Wednesday that “the University expects that any performance involving self-injury or even the appearance of self-injury (i.e. simulation) not proceed at this time.” The dean also added that “the first concern of the University is [Carter’s] ability to graduate with [his] MFA in May 2019 without penalties.” We’ve left messages with the dean of the Meadows school and with SMU’s PR team and will update if we hear back. Xxavier Carter with a previous work. The artist says he’s been communicating with various university departments, including risk management, to finalize details of the performance for about a month. He planned to have a team of seven assistants on site, as well as an ambulance (at the suggestion of risk management), in case anything went wrong during the performance. There would also be signage warning that the performance contains content that may be questionable to some viewers, a detailed description of the concepts, and a docent available to mediate conversations. It’s not all that shocking a concept considering Carter’s previous work, either. The artist has a history of highly visceral, physically demanding performances – like carrying a giant cross 10 miles across Dallas barefoot in the heat of summer. “Everybody has scars, everybody has these visual cues of who they are to other people, and they get read in a certain way by other people,” he says. The idea “is to reclaim those marks for [himself] through the act of opening them and resurfacing everything, all the trauma all the work all the pain happens at once.” The performance was to be an emotional release, immediately followed by healing. Carter might try to carry out “Rumor Has It” in different context, perhaps giving the artwork some kind of “restorative justice.” For now, he’s focused on finishing the last leg of his MFA. “My goal is to graduate and to move onto bigger and better things,” he says. Xxavier Carter will present “Better Luck Next Time” at the MFA Thesis Qualifying Exhibition opening reception tonight at 5 p.m. in the Pollock Gallery. Update: SMU responded to our inquiries on Friday afternoon with the following statement. A university should always be home to the free exchange of ideas and SMU is proud of its commitment to academic freedom and the principle of freedom of speech and expression. SMU has carefully reviewed the request of Meadows School of the Arts M.F.A. student Xxavier Carter to stage his master’s thesis performance in a public location on campus. During this review, SMU considered the potential impact for those in the campus community who observe Mr. Carter’s performance, which involves self-injury by cutting and bloodletting. Mr. Carter was requested to modify his thesis by removing the cutting or simulation of cutting from his performance. He is now moving forward with his thesis performance.